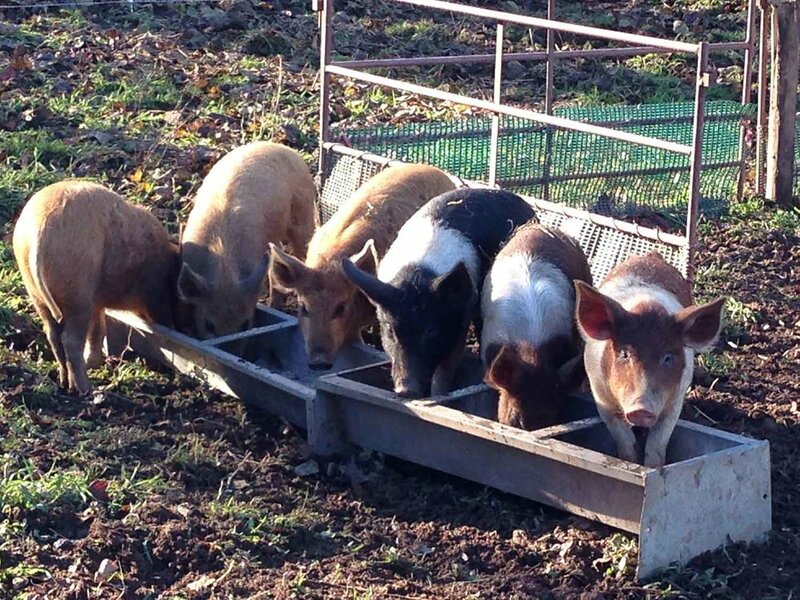 The pigs live on my smallholding which is around 15 acres. I’m high on a hillside outside the market town of Abergavenny, SE Wales, with the Sugarloaf Mountain and the landscape of the Brecon Beacons National Park all around me. Some of my land is old woodland. They clear patches of scrub land around the farm and rotovate and fertilise the vegetable patch! 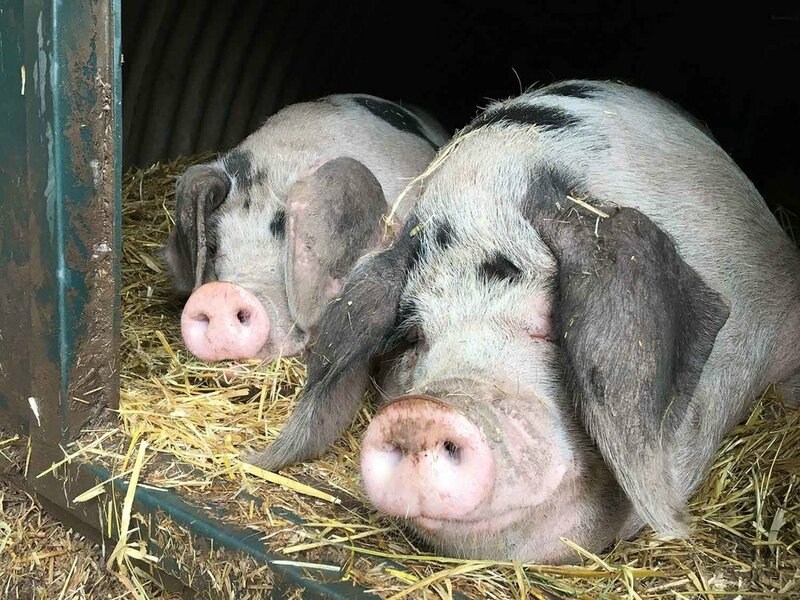 Pigs are great animals to spend time with – intelligent, friendly and sociable, nosey and funny. I realise this may sound odd coming from a meat producer. But the whole point about what I am doing is to produce meat in a way which I think is ethical. My pigs are free-range animals. What does that mean? It means they live outdoors, all year around in large paddocks of pasture and woodland. 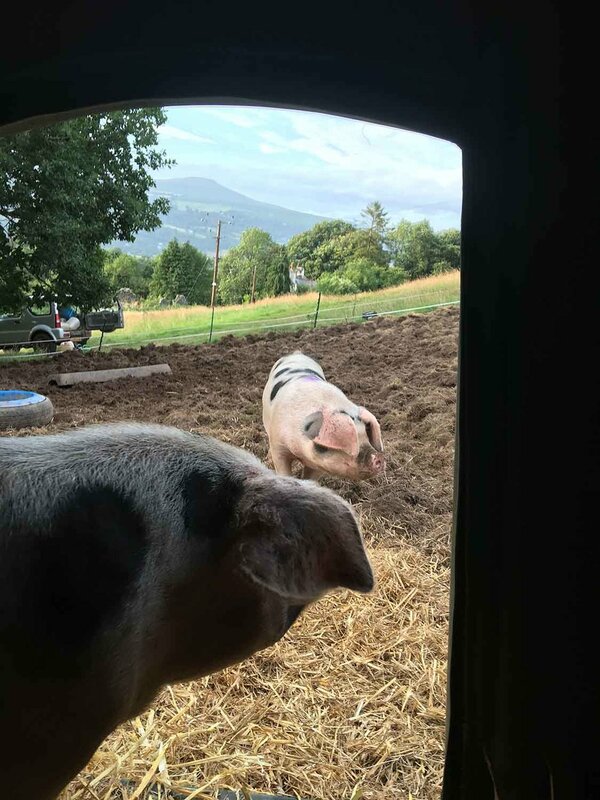 Even when the sows are farrowing (having piglets), they have access to the outdoors. Piglets will naturally start to dig within 24 hours of being born. The piglets grow up in family groups and all the pigs have cosy straw-filled arks for shelter. Unfortunately this is not the norm. The overwhelming majority of pork produced and sold in the UK does not come from free-range pigs. Free-range is important because pigs are outdoor animals. They root and forage, roam and snooze under trees. Keeping them indoors (intensively, where there are many of them confined together) does not allow them to be pigs. It’s cheaper, but it’s not a proper pig’s life. 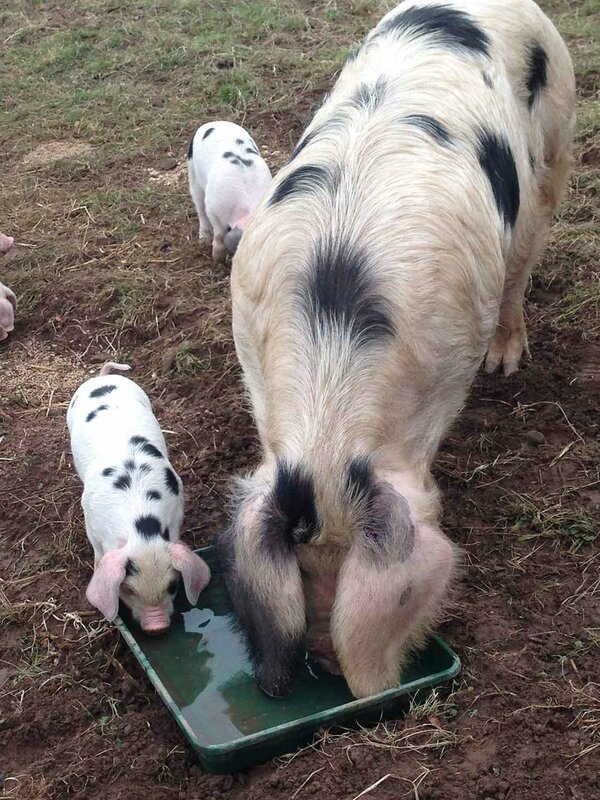 My pigs are mostly Gloucestershire Old Spots, also known as the Orchard Pig. Old Spots are a native British Rare Breed. They’re amongst a group of breeds who’s numbers are low and monitored by the RBST (Rare Breeds Survival Trust). Rare Breed pigs fell out of favour during the last 30 years because the animals grow slower and over time, lean, commercial indoor animals have replaced them to satisfy mass meat production for supermarkets. 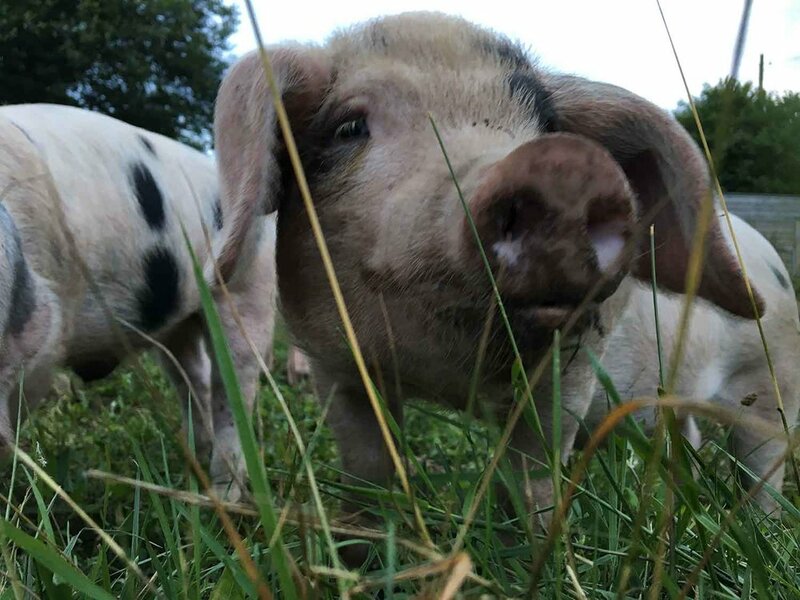 So as well as the ethical aspects to rearing free-range animals, by choosing to buy meat from a breed like Gloucester Old Spots, you are also helping to preserve this fabulous breed and their great tasting meat (it is miles tastier than the supermarket stuff). I feed the pigs on cereal pellets which helps them grow and provides much-needed protein. It is feed (non-GM) grown and milled locally. This is substituted by their daily rooting in the woodland giving acorns, beech nuts and other treats. 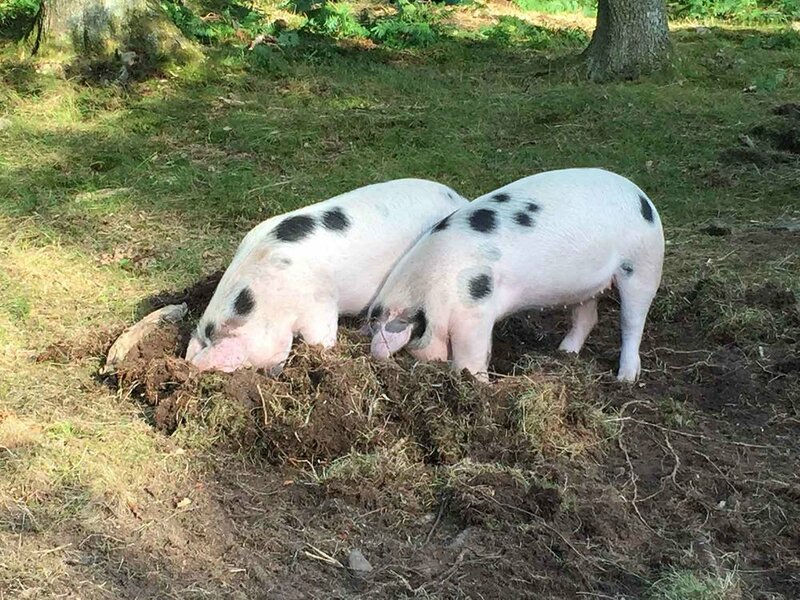 They also cheerfully chomp their way through windfall apples and pomace (fruit pulp) from surrounding farmers and orchards as the seasons change. It’s a decent place to be a pig. PS. Just a little note on antibiotics…my pigs rarely get unwell and if they do, that’s the only time they are given appropriate antibiotics. It’s important to treat animals when they’re ill, but not to overuse antibiotics, which has been the trend in many countries and farming systems in recent years.